On 5th January I'm starting a new night for Creative Writers called New Art Social. It'll be a place for emerging writers to share their work alongside more established novelists and poets. 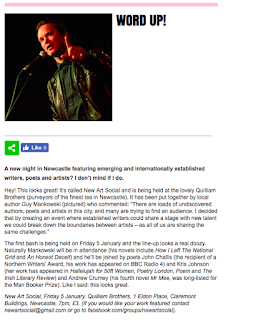 I'm keen to start to break down the boundaries between writers, given we all share the same challenges, and I'm excited by the writers who are signed up for the night.